A classic mid-century hanging bubble chair floats above the polished concrete floor. No two lights are the same, with each shade dancing in a spiral around the center bulb. 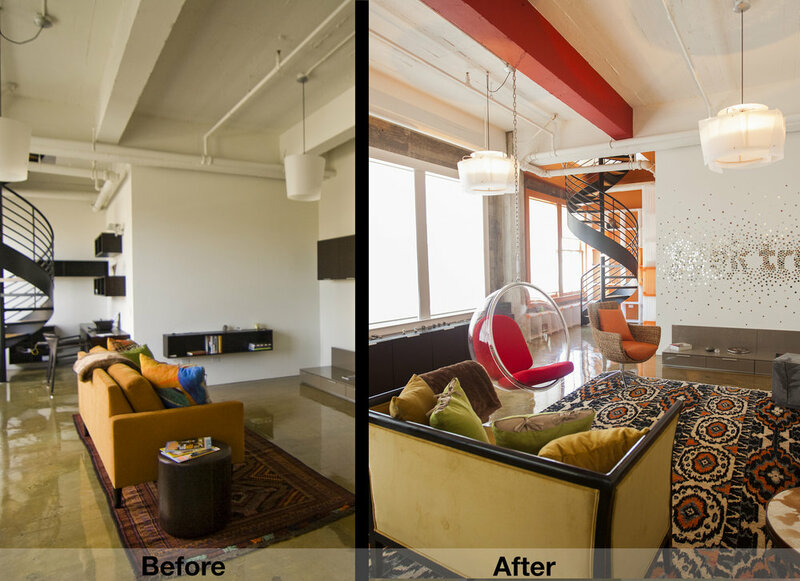 Adding vibrant paint accents to the space softened the harsh industrial feel of this old warehouse loft space. When our client bought this top floor condo, it was a big open floor plan painted all white and looking very plain & industrial. She wanted a warmer feel to this space, to make it feel like a home. The first thing we did was paint some accent walls. We painted the stairway nook a bright orange, and one of the large ceiling beams in a deep red. Then we added some soft feeling furniture. We designed and fabricated light fixtures for the main space and the kitchen, added a wall of acrylic orange and white shelving, hung a fun globe chair from the ceiling and designed and fabricated seating for the dining and living space. Now the cold industrial space is alive with vibrant colors and interesting fixtures. It feels like a home.